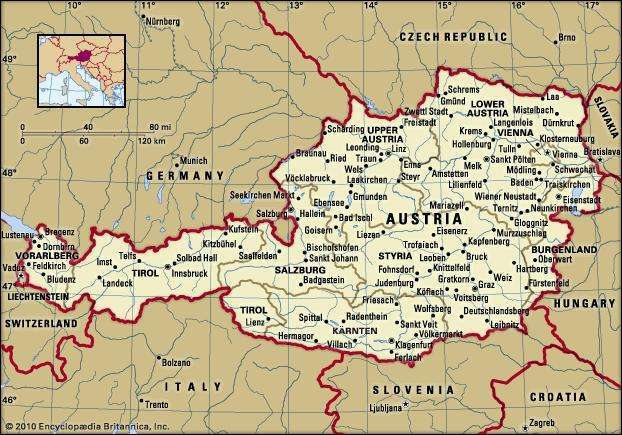 Austria, officially the Republic of Austria, is a federal republic and a landlocked country of over 8.8 million people. The terrain is highly mountainous, lying within the Alps; only 32% of the country is below 500 m (1,640 ft), and its highest point is 3,798 m (12,461 ft). The majority of the population speaks local Bavarian dialects of German as their native language, and German in its standard form is the country's official language. Other local official languages are Hungarian, Burgenland Croatian, and Slovene. Austria is a parliamentary representative democracy comprising nine federal states. The capital and largest city, with a population exceeding 1.8 million, is Vienna. Other major urban areas of Austria include Graz, Linz, Salzburg and Innsbruck. Austria is consistently ranked as one of the richest countries in the world by per capita GDP terms. The country has developed a high standard of living and in 2014 was ranked 21st in the world for its Human Development Index. The republic declared its perpetual neutrality in foreign political affairs in 1955. Austria has been a member of the United Nations since 1955, joined the European Union in 1995, and is a founder of the OECD. Austria also signed the Schengen Agreement in 1995, and adopted the euro currency in 1999. Admont Abbey (Stift Admont) is a Benedictine monastery located on the Enns River in the town of Admont, Austria. The oldest remaining monastery in Styria, Admont Abbey contains the largest monastic library in the world as well as a long-established scientific collection. It is known for its Baroque architecture, art, and manuscripts. The abbey's location on the borders of the mountainous Gesäuse National Park (the name Admont derives from the Latin expression "ad montes," "at the mountains") is of unusual scenic beauty. Admont Abbey was founded in 1074 by Archbishop Gebhard of Salzburg with the legacy of the late Saint Hemma of Gurk, and settled by monks from St. Peter's Abbey in Salzburg under abbot Isingrin. The second abbot, Giselbert, is said to have introduced the Cluniac reforms here. Another of the early abbots, Wolfhold, established a convent for the education of girls of noble family, and the educational tradition has remained strong ever since. The monastery prospered during the Middle Ages and possessed a productive scriptorium. Abbot Engelbert of Admont (1297–1327) was a famous scholar and author of many works. One of the seven ceiling frescoes painted by Bartolomeo Altomonte in his 80th year for the library. An allegory of the Enlightenment, it shows Aurora, goddess of dawn, with the geniuses of language in her train awakening Morpheus, god of dreaming, a symbol of man. The geniuses are Grammar, Didactic, Greek, Hebrew and Latin. The wars against the Turks and the Reformation (Abbot Valentine was obliged to resign because of his Reformed views) caused a lengthy decline, but with the Counter-Reformation the abbey flourished once again. In addition to the secondary school, which later moved to Judenburg, there were faculties of theology and philosophy. Abbot Albert von Muchar was well known as an historian and taught at the University of Graz. As part of the Presidency in 2006, more than 300 participants from politics, science, acadamics, art, media, diplomacy and clergy got together with the European Commission to talk about the role and future of Europe, her objects in view and chances and to give new ideas, opinions, suggestions and proposals as part of a new sound during the international conference "THE SOUND OF EUROPE". 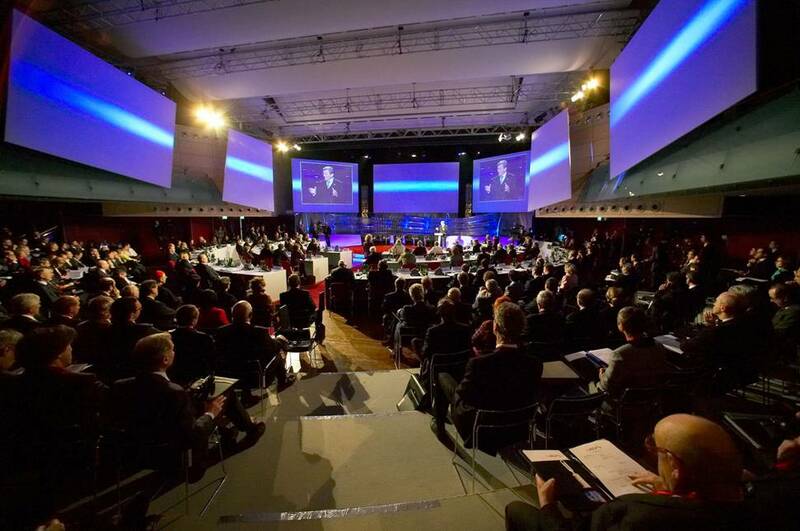 Together with the European Commission, the Austrian Presidency of the EU held a conference on the future of Europe from 27th to 28th January entitled “The Sound of Europe”. The conference took place in the congress centre in Salzburg, the city in which Wolfgang Amadeus Mozart was born exactly 250 years ago. The conference participants discussed fundamental questions as to the future of Europe, European values, identity and culture. “The Sound of Europe” followed on from a series of events held in 2004 under the Dutch EU Presidency on the subject of “Europe. A beautiful idea? ", which culminated in a final conference in Rotterdam. At the same time, the conference gave the starting signal for as wide-ranging a debate as possible on the future development of Europe, in keeping with the reflection and discussion phase decided by the European Council in June. More than 300 personalities from the world of politics, science, arts and the media deliberated on prospects and proposals for making progress on the European project in view of global challenges. The unease and scepticism people express about Europe has also been addressed, and the underlying causes analysed. The European Crisis. A Sad Sound? The first panel examined the - perceived - current crisis in the European Union, which has resulted in particular from the rejection of the European Constitutional Treaty by the people of France and the Netherlands. The panel analysed this general distrust and dissatisfaction with Europe and their causes, which are economic, social and structural in nature. Panel: Jan Peter Balkenende, Josep Borrell, David Cesarani, Benita Ferrero-Waldner, Paul Michael Lützeler, Andrew Moravcsik, Dominique de Villepin. Moderation: Rob Riemen. The divisions within the European Union during the Iraq crisis; the results of the referendums on the constitutional treaty; the row over the European Union’s budget – they are all indicators of a crisis in which the Union finds itself. But the crucial question is ‘what is the nature of the crisis?’ Are the problems and concerns mainly economic, and could a solution be couched in economic terms? Or is there a structural political problem, a crisis in politics and in our democracy, and is it all about building bridges, restoring legitimacy and confidence, reflecting on the essence of democracy? Or does the crisis in Europe point to an even more fundamental problem? Is it a crisis in European culture? The crisis of a society that – like the venerable company in the salon of Musil’s Mann ohne Eigenschaften – no longer knows what it means to be European, and is searching for the one idea that will bind, an intellectual basis from which European society could derive its identity? What is Europe? What is the essence of the current crisis? What are its underlying causes? We shall have to answer these questions first before we can begin a debate on ‘Europa quo vadis? What Next? A New Sound? The second panel developed new ideas, to move forward the European peace model and the European social model. The 21st century expects the European Union to be more for its citizens than a metaphor for key values such as peace and stability. The younger generation already takes these values for granted. Europe has to be ready to respond to everyday concerns as well as meet the global challenges. Panel: Dora Bakoyannis, Bronislaw Geremek, Gilles Kepel, Mark Leonard, Dominique Moїsi, Anne-Marie Sigmund, Ursula Plassnik, Margot Wallström. Moderation: Wolfgang Danspeckgruber. The question ‘Why the European Union?’ was always met with the standard response: ‘peace and prosperity’. But what was still a dream half a century ago, amid the rubble, is now taken for granted as a reality. At the same time, some people are asking out loud whether today’s European Union is not too much an answer to the concerns of the past and too little an answer to the challenges of the future. What kind of European Union do we want in the future? What answer do we have to the question posed by the Polish philosopher Leszek Kolakowski: ‘If we would like the EU to be [not just] a place for money temples of banks and the stock exchange, but also a place where material [prosperity] is surrounded by art and is used to help the poor, if we want freedom of speech, which can so easily be misused to propagate lies and evil, as well as being used for inspiring works – then what is to be done?’ Will the ‘Lisbon Agenda’ provide answers to these questions and have sufficient appeal to give the EU the élan that it lacks, or is something else needed? And if so, what? How much political integration is necessary? What are the concerns and the challenges for the future, and what role can the European Union play in responding to them? What does the rest of the world expect of the European Union? The third panel considered the extent to which the arts as a universal value can contribute to Europe's identity and unity. For centuries, the people of Europe have been united by works of art, visual images and symbols, ideas and inventions that have shaped and continue to enrich European cultural life. How to establish and consolidate this cultural dimension as an essential building block of Europe was the theme of this panel. Panel: Jan Peter Balkenende, András Bozóki, Ján Figel’, Martin Kušej, Paavo Lipponen, Sonja Puntscher-Riekmann, Oliviero Toscani, Pat Cox, Petros Markaris. Moderation: Erhard Busek. The Muses are the traditional custodians of the Idea of Europe. It is (or was?) impossible to be European without the knowledge of the Muses, as representing the only real European lingua franca, European art: Dante and Cervantes, Michelangelo and Vincent van Gogh, Mozart and Schönberg, Kafka and Pessoa, Fellini and Kieslowsky, Maria Callas and John Lennon, etc. Whatever doubts may exist about what is and is not European, there can be no such doubts about our history and culture. A leading European humanist like George Steiner blames the disappearance of European identity partly on a loss of cultural knowledge. In his lecture, ‘The Idea of Europe’, he noted: ‘Nothing threatens Europe more radically – ‘at the roots’ – than the detergent, exponential tide of Anglo-American, and of the uniform values and world-image which the devouring esperanto brings with it. The computer, the culture of populism and the mass-market, speak Anglo-American from the nightclubs of Portugal to the fast-food emporia of Vladivostok. Europe will indeed perish if it does not fight for its languages, local traditions and social autonomies. If it forgets that ‘God lies in the detail’. [...] The dignity of homo sapiens is exactly that: the realisation of wisdom, the pursuit of disinterested knowledge, the creation of beauty. [...]. But if young Englishmen choose to rank David Beckham high above Shakespeare and Darwin in their list of national treasures, if learned institutions, bookstores, concert-halls and theatres are struggling for survival in a Europe which is fundamentally prosperous and where wealth has never spoken more loudly, the fault is simply ours. Historians have not forgotten that for many intellectuals, poets, and artists, one of the many driving forces underlying the First World War was a conflict between ‘Kultur’ and ‘Zivilisation’, between cultural, metaphysical values on the one hand, and political and social values on the other. ‘Zivilisation’ won, but with the freedom of the individual came the culture of the masses. Why should that be a problem? Haven’t the Muses frequently turned out to be Sirens that plunge Europe into disaster? And don’t films like Star Wars, Schindler’s List, and The Matrix have just as much educational value as, say, War and Peace? Isn’t the plea for ‘high culture’ inspired all too often by nostalgia for a Europe that has vanished, or is there in fact a link between the fact that this culture is like a museum and the Europeans’ identity crisis? What knowledge do we need to be European? What images can we use, what do we communicate when we are Communicating Europe? Perceptions and a short report as feedback. On inivitation of the Austrian federal chanchellor Dr. W. Schüssel, I participated the conference 'The Sound of Europe' in Salzburg. My share during the conference and the special situation gave me the impuls for this feed back. This report is meant to be a confirmation, a mark that people and institutions have reached each other directly about an important subject. Although there is a distance between institutions and people, there is obviously sometimes also a direct dialogue possible on such level. 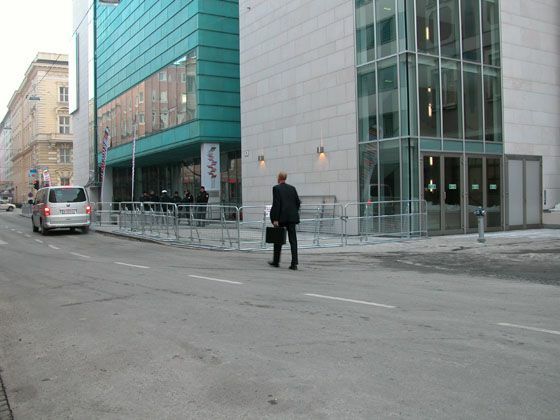 The conference was a logic continuation on the in 2004 organized 5 conferences "Europe, a beautidea? ' The Sound of Europe', organized by the government of Austria during their EU presidency, was held out of the need and necessity to give a renewed content to identity, culture and values, so that a starting shot could be given for the future of Europe. The conference itself knew a firm programm: speeches, reports and working lunches. All with the intention to develop and give further impulse to the idea and necessity to Europeanize. It should be great if the sparks will jump over, so that numbers of citizens will become stronger Europe-mindend and will get deeper common feelings. I loved the speeches, debates and the moments in which I was involved and could give some of my input. According to me an important point is that civilians have to notice a more concious perceptible advantage out of the European Union. How that could be reached is more difficult to answer. A peace and social model is already existing but not everyone is aware of the Classics or is interested in it. It is already written: "Europe has to be ready to respond to everyday concerns as well as meet the global challenges": That means an ongoing task for citizens and institutions and also an ongoing communication between these two. The program went from thursday-evening 26-01 up to and including saturday-afternoon 28-01 and consisted on the one side of the conference with a working lunch and on the other hand of invitations for receptions, dinners, a concert and a visit to a museum. Place and date were choosen because of the 250th birthday of Mozart who, besides his fine ear for music, is also known as a prototype European. The Councel of the European Union would made it possible that important points of view of personalities could be exchanged openly with each other and would realize that a lot of fundamental questions could be talked about. There were discussions about identity, the role of (common) values, culture, the total position and the perspective of Europe. Also the displeasures and doubts that are pronounced against Europe and the underlying causes of these expressions got chances. Everybody who want to know everything about (the whole proceedings of) the conference can further look at the verbatim record, and the list of participants. 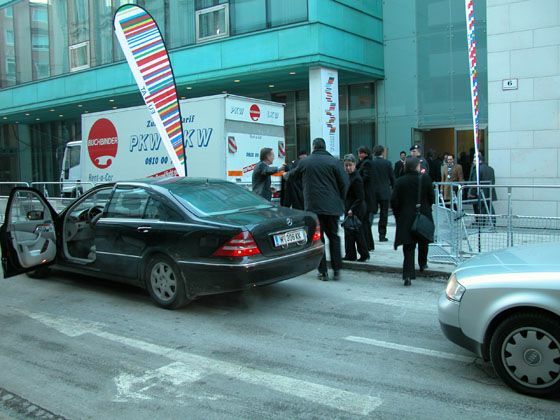 The conference with the working lunch 4 Theme’s were contrived for the conference: The European Crises. A Sad Sound? What Next, a New Sound? Muses and Sirens and The Final Debate: Conducting Europe.The program went down according to a fixed structure: opening statements, keynote speeches and core panels. 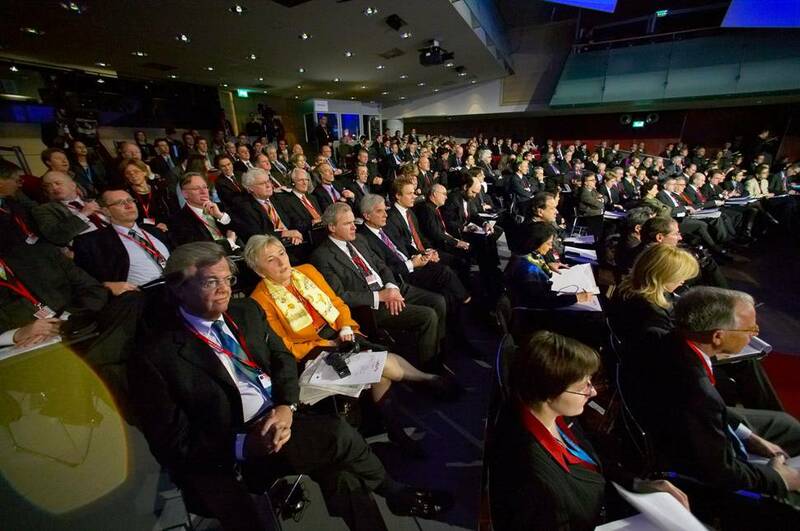 Amoung the speakers, there were presidents, prime ministers, the mayor of Athene and ministers of foreign affairs. Participants were also enabled to discuss about the future of Europe during working lunch sessions (see notes). I was present with the discussion about the topic “Is there a democratic vacuum in Europe?” The summary of students of the Diplomatic Academy Vienna shows among other things that democratic values remain at the core of Europe and that behind different perspectives, the impression is one of unity and concerned pragmatism: democracy in Europe is at work. Except the conference the possibilty was given to me to go through receptions, dinners, a concert and a visit to a museum. All of them I have experienced it as intense and I have lived to see them all as highlights and with enormous feelings of joy. Very special to me were the Mozart festive concert (*), the dinner at the Salzburg-residence and the informal meeting in the museum der Moderne. The period in Salzburg has been one of an unprecedented perception. So, I approached Dr. W. Schüssel to thank him for his invitation that he has made it possible for me to discuss about the future of Europe and to contribute to the identity-problem, the importance of values and cultural atmosphere. An expression of gratitude was replied: 'It seems of particular relevance to him that a process has started which helps to improve the communication with the citizens of Europe, thus laying the basis for a better understanding between institutions and people'. After such conferences I always think and now? How to proceed? What do I notice outside on the streets and when? It is out of the question that the conference was a great succes and has given a further impulse to the idea and necessity to Europeanize. The contents of statements and speeches may not ebb away. Attention-points from this are very useful for further use. Perhaps that programs/action plans, from lower level, should be developed and that ambassadors/representatives should have appointed to realize fixing aims. 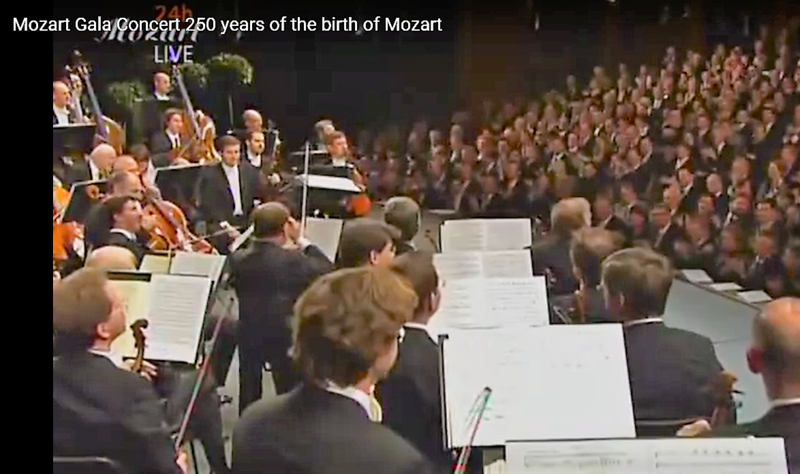 An undisputed highlight of the Mozart Year 2006, this Festkonzert Salzburg. Internationally renowned soloists such as the baritone Thomas Hampson, violist Yuri Bashmet, violinist Gidon Kremer and pianist Mitsuko Uchida made ​​an appearance. Together with the Vienna Philharmonic conducted by Riccardo Muti was a tribute brought to Wolfgang Amadeus Mozart, the composer to this day to inspire people know whose music and move. On the program: Piano Concerto Nr. 25, Aria for baritone and orchestra 'Rivolgete a lazy lo sguardo, recitative and aria from Le Nozze di Figaro, Duet "La ci darem la mano" from Don Giovanni, Sinfonia Concertante for Violin and Viola, Symphony Nr. 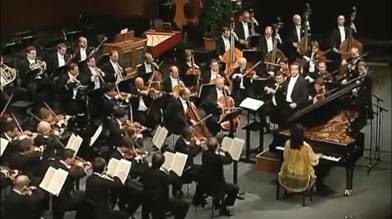 35 'Haffner' and the final chorus from Die Zauberflöte.Riccardo Muti, Wiener Philharmoniker, Thomas Hampson (baritone), Gidon Kremer (violin), Yuri Bashmet (viola), Mitsuko Uchida (piano). Allein der kostbar funkelnde Solitär des h-Moll-Adagios, KV 540, 10, 15 Minuten knapp und ewigkeitsschön, hätte diese Jubiläums-Mozartwoche schon gerechtfertigt. Aber die Pianistin Mitsuko Uchida, bereits als Kammermusikerin mit dem Hagen Quartett und als Konzertsolistin und Arien-"Begleiterin" im Festkonzert an Mozarts Geburtstag eine Klasse für sich, hat in ihrer Solomatinee am Montag noch die c-Moll-Fantasie, KV 475, mit der Sonate, KV 457, die F-Dur-Sonate, KV 533/494, und die D-Dur-Sonate, KV 576, und als Zugaben die langsamen Sätze aus KV 330 und der "Sonata facile" dargereicht und damit für zwei unvergessliche Sternstunden gesorgt: Dieser Höhepunkt wird kaum noch überboten werden können. Karl Harb gerät ins Schwärmen. Nehmen wir nur das Adagio von 1788, drei Jahre vor Mozarts Tod. Es ist eine wahnwitzig zerklüftete Klanglandschaft. Das "nihilistische" Dreitonmotiv könnte durchaus vom späten Liszt stammen, dann erinnern "Fragmente" daran, was Schönberg 130 Jahre später komponierte, und die letzten Takte, unheimlich nach Dur gelichtet, sind schmerzlich schöner Schubert. Mitsuko Uchida zeigt alle diese vorausweisenden Kühnheiten und bettet sie doch in die klassischen Regeln ein, die Mozart permanent sprengt. Atemberaubend sind ihr Formgefühl, ihr Sinn für Proportionen und Balance, der Reichtum an Klangfarben im Großen und im Detail, ihre unbestechlich perfekte Disposition der Zeit, ihre makellose pianistische Beherrschung, Flexibilität des Anschlags und sensationell dienstbare Technik. Eine Interpretation der kleinen Wunder und des größten Wunders: Mozart. Mitsuko Uchida spielt nicht einfach Mozart (das bei Gott nicht einfach, sondern, wie alle wissen, das Schwerste ist). Sie sagt etwas aus, bringt Klang zur Sprache, Musik zum Leben, macht Unbegreifliches ereignishaft und lässt dem Wunder doch das Wichtigste - das Geheimnis. Sie leuchtet mit ihrem superben, so herrlich vielschichtigen Klavierspiel hinein ins Unbeschreibliche - und dabei lassen wir es bewenden. Sprache muss schweigen. Sagen wir nur noch, dass die Dur-Sonaten zwischen delikatester Quecksilbrigkeit und dem Zauber des Einfachen ebenso neue Dimensionen aufschließen wie die wuchernde Dramatik des c-Moll. Und wer das "Einfache" der "leichten" Sonate so zaubrisch einfach sein lässt, der hat wirklich das "Wunder Mozart" ermöglicht: ein Traum. Here you can find information about the aims, content, motives and organisation of the conference "The Sound of Europe". develop new ideas, suggestions and concrete proposals as part of a new project to foster the idea of Europe including its communication. Session One will look at the – perceived – current EU crisis which resulted from the rejection of the Constitutional Treaty by the Dutch and the French; it also analyses its dimensions and components. Session Two tries to develop possible responses and concrete new ideas to move forward by putting key issues of today’s EU, its capabilities and challenges into the global perspective and draw inspiration from the tasks and opportunities Europe is facing in the world at the beginning of the 21st century. Session Three focuses on how the universe of ideas, the music, art, symbols and values contributes to Europe’s identity and unity and searches for possible improvements. The conference will arrange for written summaries and key participants will offer the findings and conclusions during a televised round table of senior European leaders and intellectuals. Generally speaking, questions like “What is Europe?”, “How much political integration is necessary?”, “What are Europe’s tasks for the future?” etc. should find answers within a European “community” in the making. Is the conference part of the discussion about the future of Europe? Yes. It aims to give further impetus for broad debates on Europe and contribute to a paradigm change towards a new community awareness and – possibly – an injection of optimism into our societies. Why talk about “European Identity”? Maybe instead of “European Identity” we ought to speak about Europeans’ “we-consciousness”, in order to escape the trap of a “negative identity”, characterized by concepts and catch-words like “anti-American”, “anti-Jewish”, “anti-Islam”, etc. However the term “European identity” is widely used and well understood, so it makes sense not to ignore it. Sometimes it seems that the revival of a European spirit and of European “identity” is most strongly perceived outside Europe, especially by scholars in the United States of America. When and where? 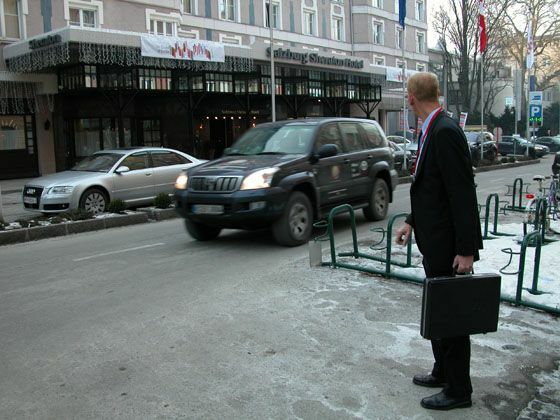 The Conference will take place on 27 and 28 January 2006 in the “Salzburg Congress” building adjacent and linked to the Sheraton Hotel and across the street from the Crowne Plaza Hotel, west of Mirabell Castle. Who will attend the Conference? Prime ministers, high-ranking political figures, prominent representatives of the European institutions, leading personalities from the world of the arts, science and civil society, and a number of young people from all over Europe, some 300 participants in total. Will the Conference be open to the media and the public? Yes. Journalists are invited to the Conference. The Austrian public TV network ORF will be host broadcaster. There will be media facilities for international journalists and opportunities for interested members of the public to observe the Conference. The closing debate by political leaders will be broadcast by Austrian television. The general public is represented by members of elected bodies and representatives of civil society, and not least by the 70 or so young people from all over Europe. Where did the idea for this Conference come from? The series of events under the heading “Europe. A beautiful Idea?” organised by the Nexus Institute (NL) in 2004 during the Dutch Presidency provided the theme for this Conference. Federal Chancellor Wolfgang Schüssel decided to continue this work during the Austrian Presidency of the Council of the EU in 2006.
Who are the organisers? A taskforce in the Austrian Federal Chancellery headed by Ambassador Klaus Wölfer. Further intellectual input is coming from academia in Austria and other European countries, from Rob Riemen, the founder of the Nexus Institute in Tilburg (NL), Prof. Wolfgang Danspeckgruber (from the Liechtenstein Institute on Self Determination at Princeton University in New Jersey) and the Bertelsmann Foundation. Can the Conference be described as a kind of European Council? No, certainly not. Federal Chancellor Schüssel has taken the liberty to invite politicians and other personalities from different fields in person, without any intention of imitating existing formats. Why are some countries very well represented at various levels while others are not? For the same reason: We have no conventional set-up and no country delegations, but guests accepting direct personal invitations by the Austrian Prime Minister. Therefore it can happen that some countries, regions or professional groups are over- or underrepresented, but no particular significance should be attached to that. Why is the Conference called the “The Sound of Europe”? This is somewhat self-ironic: a 1965 Hollywood film set in the province of Salzburg did much to create a romantic, basically very positive image of Austria to the outside world. Its title was “The Sound of Music” and it had a happy end. The subject and challenge of this conference, in turn, is Europe, and we believe that Europe – as any community – has its own sound as well and that the European idea will developand end up well. So the Conference “The Sound of Europe” is not about music at all? No, not directly. 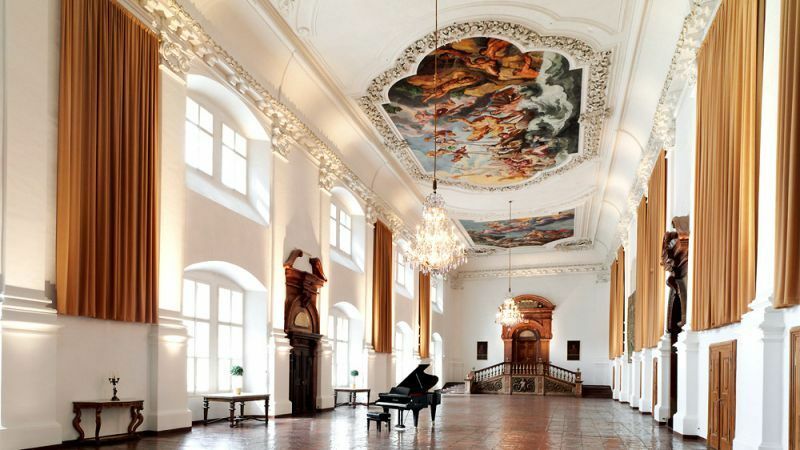 But of course Salzburg will be full of Mozart's music and concerts, so we definitely will not neglect that aspect. Federal Chancellor Schüssel recently said in an interview: "The Sound of Europe is a homage to the European genius Wolfgang Amadeus Mozart. The whole world knows what the European sound is. It's Mozart." Does the Conference have any sponsors other than the Austrian Government? The conference addresses basic questions of Europe’s future and is part of the debate to establish a European public space supporting the Commission’s “Plan D” – for Democracy, Dialogue and Debate. Hence, the European Commission has indicated that it will act as a major co-sponsor. The same goes for the European Economic and Social Council, whose president has made questions of European identity a major issue of her programme. Where has the Conference logo come from? It has obvious similarities to the official Presidency logo, but at the same time there are clear differences.The Presidency logo was designed by the Dutch architect Rem Koolhaas and his team. It is a barcode made up of the European flags. The Conference logo is a variant, and its wave form symbolises the "Sound of Europe". Thursday 26 January 2006, Friday 27 January 2006, Saturday 28 January 2006Thursday, 26 January 200616.00: Press session on presentation of the book “Europa – eine Idee nimmt Gestalt an” with Hans Brunmayr, Director-General for Press and Communication and Head of Protocol in the General Secretariat of the Council of the European Union (publisher), Salzburg Congress Centre, Karajan Saal16.30: Lecture followed by discussion "Quo vadis Europe – Challenges of European integration in the age of globalisation" with Benita Ferrero-Waldner, EU Commissioner for External Relations and European Neighbourhood Policy Salzburg University, Kapitelgasse 4, auditorium 230. Organiser: Salzburg University, European Commission Representation in Austria, in cooperation with the newspaper "Salzburger Nachrichten".17.00: Presentation for the press of the audiovisual installation “Europe in Sight” – 5 digital media projects open up unexpected prospects, with Gerfried Stocker, Ars Electronica Center, Linz, Salzburg Congress Centre, meeting point: ground floor19.30: Press conference with the President of the European Council, Federal Chancellor Wolfgang Schüssel and the French Prime Minister Dominique de Villepin, Salzburg congress centre, Karajan room (German/English/French interpretation)Friday, 27 January 20069.00 Beginning of the conference "The Sound of Europe". Welcome and introduction by the President of the European Council, Federal Chancellor Wolfgang Schüssel and Margot Wallström, Vice-President of the European Commission. First panel and plenary discussion: "The European crisis. A sad sound?". Second panel and plenary discussion: "What now? A new sound?" Keynote speech: Javier Solana, Secretary-General of the Council of the European Union and High Representative for the Common Foreign and Security Policy. Core Panel: Dora Bakoyannis, Bronislaw Geremek, Gilles Kepel, Mark Leonard, Dominique Moїsi, Ursula Plassnik, Anne-Marie Sigmund, Margot Wallström. 9.00: Opening address Federal President Heinz Fischer, José Manuel Barroso, President of the European Commission. Third panel and plenary discussion: "Muses and Sirens". Keynote speech: Franz Welser-Möst, Conductor. Core Panel: Jan Peter Balkenende, András Bozóki, Ján Figel’, Martin Kušej, Paavo Lipponen, Sonja Puntscher-Riekmann, Oliviero Toscani, Petros Markaris, Pat Cox. 11.30 Closing debate: "Conducting Europe" (broadcast live on ORF 2). Panel: Jan Peter Balkenende, José Manuel Barroso, Wolfgang Schüssel, Vaira Vīķe-Freiberga, Matti Vanhanen, Paavo Lipponen, Nikolaus Harnoncourt, Jürgen Flimm. Moderator: Roger de Weck 13.00: Closing press conference with the President of the European Council, Federal Chancellor Wolfgang Schüssel, and the President of the European Commission, José Manuel Barroso, Karajan Room/Salzburg Congress Centre (interpretation: German, English, French)14.00: Discussion with EU Commissioner Ján Figel' and members of the Salzburg arts and culture community on the subject "The impact of art and culture on the European identity. The EU and the cultural identity of the regions" in the Stiftskeller St. Peter, Felsenstube. Organiser: Culture Department of the Land Salzburg and European Commission Representation in Austria15.30: Public debate: "Europe: Our expectations – our objectives" with Josep Borrell Fontelles, President of the European Parliament, José Manuel Barroso, President of the European Commission, Margot Wallström, President of the European Commission, responsible for Institutional Relations and Communication Strategy, Gabriele Burgstaller, Governor of Salzburg, Salzburg Congress Centre, Karajan Saal (Interpretation: German, English, French). Organiser: Land Salzburg Europe Office, EuropeDirect Info Point Salzburg, European Commission Representation in Austria, in cooperation with the newspaper "Salzburger Nachrichten". Wolfgang Danspeckgruber, A Princeton University, N.J.
Andrew Moravcsik, USA Princeton University, N.J.
27 January 2006: Opening statement by Federal Chancellor Wolfgang Schüssel, President of the European Council at the conference "The Sound of Europe" in Salzburg. Ladies and Gentlemen!Welcome here in Salzburg on 27 January 2006. Exactly 250 years ago today, Wolfgang Amadeus Mozart, a true European genius, was born. With this conference on "The Sound of Europe", I wanted at the same time to give the starting signal for a European debate on the future of Europe.I should like to extend a very warm welcome to all of you, and - as it would take too long to mention every one of you personally - specifically to our Federal President Heinz Fischer, the Prime Ministers Dominique de Villepin of France, Jan Peter Balkenende from the Netherlands, Matti Vanhanen from Finland, the President of the European Parliament, Josep Borrell, the President of the Finnish Parliament, my old friend and colleague Paavo Lipponen, and, of course, the co-sponsor and co-organiser, the European Commission. Commission President Barroso unfortunately is not here with us, but I am pleased to extend a hearty welcome to the Commission Vice-President Margot Waldström, who is going to open the conference with me, and to her fellow Commissioners Benita Ferrero-Waldner and Jan Figel`. I am very pleased that you have joined us here in Salzburg. I also wish to thank the team who has prepared this conference. On the way in to the conference room, you will undoubtedly have noticed a whole series of video installations. These are the work of the Ars Electronica group, who have endeavoured to translate the theme of Europe into a language of pictures and light and to convey the ideas many people have put to paper about Europe in a form that can be seen and heard. What is the background to this conference? Let me mention my friend Jan Peter Balkenende at this point. During the Dutch Presidency, he embarked with the support of the Nexus Institute on a treasure hunt in Europe in the form of a discussion series entitled "Europe - A beautiful idea". The issues discussed at the time have become all the more explosive in 2005, since the European Union has stumbled into crisis following two failed referendums on the Constitutional Treaty and a very difficult, because unsuccessful, summit meeting on the financial perspective in June 2005. At this June summit just over six months ago, the Heads of Government decided to launch a reflection phase that was to be used to seek out and articulate the reasons for the unease many of Europe’s citizens feel, perhaps not only - or not specifically - about the text of the Constitutional Treaty and to seek solutions, answers to the questions. In this spirit, we want to develop the Dutch Presidency’s idea in a situation that has obviously evolved since then, but not become any easier, in a quest for solutions and answers. The first panel will explore this unease, the criticism, the feelings of crisis in Europe, and attempt to analyse the underlying causes. The members of a second panel will discuss possible practical solutions, while the third panel tomorrow will above all look at the role of the arts and culture in Europe and the European identity. Finally, the political conclusions that can be drawn from the panel contributions will be the subject of the closing debate.Ladies and Gentlemen! Today is not only the anniversary of the birth of Wolfgang Amadeus Mozart; it is also Holocaust Memorial Day, the international day of remembrance of one of the greatest horrors of European history. Exactly 61 years ago, the concentration camp Auschwitz was liberated by the Red Army. Auschwitz, too, as a synonym of crime is part of Europe’s history, and must be included in our reflection. To quote Josef Krips, a great Austrian conductor who is unfortunately no longer with us: “While the one – Mozart — is from Heaven, the other – Auschwitz – has now become the synonym of Hell”. Both sides of the coin — paradisiacal expectations, dream, vision and also the reality of failure, crime, evil, Hell – are part of Man’s identity and probably also of Europe’s identity. Mozart can provide some answers or help us find answers. He was born and lived at a time marked by dramatic changes: maybe this is something worth remembering for Europe’s citizens today. If many people today fear change, the “wind of change”: the change then was unlike anything that had gone before. The American Revolution, for example. The Bill of Rights was written in the year of Mozart’s death. The French Revolution. Adam Smith described the foundations of modern society in his work “Wealth of Nations”. As Mozart was composing “The Abduction from the Seraglio” in Vienna, Hegel was writing the Phenomenology of Spirit”. The Industrial Revolution began with the invention of the steam engine, the discovery of electricity. Industrial and computer-controlled looms were invented. The modern print media – I take this opportunity to welcome the mass media, journalists, radio and TV reporters – can trace back their origins to that time. There are two newspapers in existence today which already existed then. The “Neue Zürcher Zeitung” was established in 1780, the “Times” in 1788. Mozart himself travelled through Europe like a whirlwind during this period of change and made his mark on European history. If we consider that he spent one third of his short life on his travels and visited and experienced 200 European cities, and perhaps also helped compose their sound, it can truly be said he was a part of this change. He had a premonition of some of the things to come. He sensed - and I owe this thought to Martin Kušej – that events can end in a catastrophic bloodbath. Take the opera “La Clemenza di Tito” for example, which ends in a bloodbath and an attack on the Capitol during a groundless attempt to assassinate Emperor Tito. Mozart already sensed the coming of the French Revolution and at the same time gave the answer as to how to put things back in order: Not with weapons, but with music. In the Magic Flute, the military and pursuers are halted, made to dance, by a magic flute. A great deal of this agony of change, the labour pains, growing pains, pains of maturity, we are naturally also experiencing today in Europe. This Europe must not become a purely economic idea; I say that quite openly here. Europe must be more, it must find a cultural identity, reflect on what holds us together, where its borders lie, what are its objectives, its possibilities. It must develop a sense of realism and of what is feasible. It needs a spirit, not only a common currency, but a common goal and common projects. Ladies and Gentlemen! Before I hand over to Margot Wallström and invite her to open the conference with me, I want to quote an author who also knew a great deal about music. Hermann Hesse said: “For one who loves music, the world has one more continent.” Perhaps Wolfgang Amadeus Mozart and his relationship with Europe can have a motto, such as “Music of the future for an old continent”. It would be nice if this succeeded, if Europe was no longer part of the problem, but part of the solution. I wish the conference every success. 27.01.2006: Opening statement by Vice-President of the European Commission Margot Wallström at the conference "The Sound of Europe" in Salzburg. 27.01.2006: Keynote speech by the French Prime Minister Dominique de Villepin at the conference "The Sound of Europe" in Salzburg. The fact that Europe continues to celebrate and love its great artists, that it listens to them and draws inspiration from them is a sign that our creative potential is intact. That Austria is taking over the presidency of our Union is also good news. Austria is part of our overall history — lt is a country that is very close, very similar to France. You are the heirs of those many nations that came together to increase their strength, that were able to blend their languages, cultures and traditions in a spirit of tolerance, that challenged even those certainties most deeply rooted in our minds, that experienced empires and the dismantling of empires, power and equilibrium, and that know how to look at their past with a lucid mind. So, Mr Chancellor, I would like to express my confidence and my hope: I know that over the next six months Europe will be in good hands for the task of recovering its self-confidence. Our fellow citizens are asking whether Europe is still capable of making operational decisions, rapidly, to meet their expectations. The complexity of our institutions, the ponderousness of our regulatory mechanisms and the length of time it takes to achieve consensus are today seen as obstacles to European political action. For instance, for several weeks now we have been discussing extension of the 5.5% rate of VAT for the building sector. Many people have difficulty understanding why we are not making faster progress on a question that concerns tens of thousands of jobs in 9 countries of the European Union.This risk of paralysis is even more worrying in that the world is changing very fast and we are facing increasingly stiff international economic competition. At a time when new economic powerhouses such as India or China provide further proof of their vitality every day, Europe cannot remain immobile. It must take advantage of globalisation, win new market share, innovate and create leading-edge products to stimulate its own growth and create new jobs.This crisis of European decision-making goes well beyond a simple problem of operation - it is also an appeal for more democracy in Europe. Who makes the decisions today in Europe? In whose name? How are the choices that will durably affect the future of our societies made? How do we assess the results? Who accepts responsibility when a given measure proves to be ineffective? When do we decide to go back on a decision? Democratic transparency is a national imperative that governs the legitimacy of every one of our decisions. lt is also an imperative for Europe, since political Iegitimacy today is less the product of debate and declaration than of decision and results. But Europe is also experiencing an identity crisis. Many citizens are questioning the purpose of European Integration. What do we want to become? A federal Union along the lines of the United States? A confederation of nation¬-states? Or do we wish to become simply an economic space defined by the absence of borders and customs barriers? These questions are in all our minds, but we have never spoken plainly about them together. It is time to resume the debate and to set a course. Europe has been built in reverse: it is defined more by movement than limits, by progression rather than goals. The political origins of Europe can be found in the declaration made by Robert Schuman in the Salon de l'Horloge at the Quai d'Orsay, when he announced the creation of the European CoaI and Steel Community between France and Germany. Take the Treaty of Rome which, in 1957, founded the 6-member European Community: the very foreword to the treaty recognized the embryonic nature of this union, since it declared that the signatories were "determined to establish the foundations for ever closer union between the peoples of Europe." The project to draft a constitution for Europe under the aegis of Valéry Giscard d'Estaing aimed at remedying this lack of a solid foundation. We are obliged to admit today that this important step was not understood by everyone. Finally, and this is perhaps the key to this identity crisis, Europe seems to have difficulty defending its values. In a world that is tending increasingly towards uniformity, European citizens have the impression that Europe is gradually losing ground and that it risks losing its specific identity in the movement of globalisation. And yet, over and above the differences arising out of the history of each nation, we Europeans share the same desire for solidarity, social cohesion and equilibrium between justice and economic dynamism. In Austria, France, the United Kingdom and Denmark, we share the same conviction that the state has a special responsibility: to protect employees, to guarantee a certain number of services such as health or education, to ensure equal opportunity and to come to the assistance of the most disadvantaged. Today, Europeans feel that we are not adequately defending these aspirations and that Europe may become simply a mechanism for advancing globalisation. Let us be clear: if Europe becomes merely an economic project, if the member states see membership solely as a way of obtaining certain economic benefits, then our Europe has no future. Our values are what give us our identity and our strength, what makes our voice both singular and powerful. And that is why I would like to salute the initiative of Chancellor Schüssel, who has decided to place die Austrian presidency of the Union under the aegis of our common values. 2. Faced with this situation. I would like to express my conviction: Europe has always been able to make every crisis the springboard for a new leap forward.Yes, there truly is European adventure.This adventure is that of a specific human being, with his/her aspirations and doubts, successes and trials: the European. For, leaving aside the diversity of our peoples, I am convinced that there are a number of characteristics that define this universal human being and which we all share:A European is first and foremost a person who is open to others. This is the distinctive imprint of our geography and our history: no other continent has succeeded as well as Europe in welcoming cultures, adopting new techniques, accepting discoveries made elsewhere and integrating them into our own tradition. Openness is also the capacity to step outside one's self and reach out to others: Europeans have never abandoned their thirst for discovery nor their curiosity about the world outside their continent. From the crusades to the Conquistadors and the empires, for many centuries this search bore the hallmarks of conquest and the will to dominate. Today, it is inspired by ideals of respect and exchange. For being European means recognizing that we come from elsewhere, that our heritage is many¬stranded and that we need others in order to understand ourselves. The outside world has helped us grow and we are strengthened by our discoveries und our aspirations. The European is also someone who has understood the limits of power and the spirit of conquest. We have a profound sense of history, marked by the wounds that our rivalries and conflicts have inflicted on us. The territory of Europe bears the marks of the borders over which we have fought, the trenches we have dug und the walls we have erected. How many times has Europe promised itself "never again"? How many, times has it proclaimed peace only to be caught up in the dreadful spiral of war and barbarity? Adorno asked whether lt was possible to write poetry after Auschwitz. He could just as well have asked whether the spirit of Europe still had any meaning after Auschwitz, Sobibor und Treblinka.We Europeans have been experienced the most dreadful ordeals, we have lived years that deserve to be erased, we have committed irreparable crimes, things that our imagination refuses even to conceive today. And yet, after doubting their own humanity, Europeans were able to liberate themselves from the fatality of history. By building their future on the French-German relationship, they chose the path of reconciliation. They built their future on a dual identity: the nation and the political ideal still to be defined - Europe. As Musil said: "Each of us has a second country where everything we do is innocent". For each of use, Europe is indeed this second country. Austria is perhaps the best example of this European spirit. What your country underwent at the turn of the last century foreshadows the major issues with which Europe is now confronted:The issue of nation und motherland, to begin with, in a country that bears the memory, of the Austro-Hungarian empire: this polyglot empire that prefigured Mitteleuropa looked for the first time at the problem of identity. Where was the empire's centre? Was it, as Hermann Broch said, the empty box set aside for the emperor in every theatre in every town of the empire? Was it the Cacanie of The Man without Qualities, the impossible reconciliation of the quest for unity, and the loss of meaning? These are the same questions we are asking ourselves today about our common future.The end of the Austro-Hungarian empire also brings us back to questions about power: its legitimacy and its real capacity to change the world. This questioning has continued to inspire your great writers, from Thomas Bernhard to Elfriede Jelinek.Austria has also played an important role in European culture:When Klimt resigned from the association of Viennese artists in 1897, he set the course of European modern art for many years: a course of secession, transgression and constant challenging of our certainties.Whether in architecture, painting or music, we owe to Vienna the concept of the avant-garde, which belonged only to Europe throughout the 2Oth century and was summed up by Elias Canetti: "lt is a trait inherent to the insatiable hunger but also the vehemence of youth, that one phenomenon or adventure inevitably supersedes another".In this way, Austria reminds us that the European is defined by his capacity to renounce his certainties, to experiment, to explore new paths. Is it a coincidence that in this Vienna of the turn of the last century, one man, Freud, dared to go further than all the others in exploring the unconscious and dreams?Finally, Austria offers us a certain image of European sociability. Since Erasmus, the European has built his character on the books he reads, his travels and his encounters. And since we will now be celebrating the memory of Mozart, how could we forget his many journeys throughout Europe? As a child, he played the harpsichord for Mme de Pompadour; later he composed music for the greatest German princes und saw Don Giovanni staged for the first time in Prague. The European feels at home everywhere in Europe, or, to repeat a remark made by Georges Steiner, he or she feels at home everywhere there are cafés, like the Schwarzenberg, the Central or the Hawelka in Vienna. Why cafés? Because they are cosmopolitan places where you can read newspapers from all over the world; because they are places for meeting and exchanging views that ignore the divide between social classes or generations. But most of all because cafés are places of culture where, from Stefan Zweig to Karl Kraus, people take the time to think and meditate. Europe's strength is its capacity to overcome crises. Because European thought has always been forged in doubt and questioning. Europe's strength is that it is never satisfied with what is, that it is always ready to challenge a fundamental truth to find another, even more solid.Jorge Semprun has often told me of the importance he attaches to a lecture by Husserl entitled "Philosophy, or the Crisis of European Humanity¶ Husserl gave this lecture in Vienna, in 1935, when he had already been disbarred by the German universities and Europe was suffering the assaults of totalitarian movements. In his lecture he said that "the crisis of European existence can end in only one of two ways: in the ruin of a Europe alienated from its rational sense of life, fallen into a barbarian hatred of spirit, or in the rebirth of Europe from the spirit of philosophy, through a heroism of reason." Europe's wisdom is that it has made every crisis an invitation to a new beginning.The history of our continent is strewn with difficulties, trials and rivalries, all of which were obstacles on the path of European peace. This is true, in particular, of the relations between our two countries, both pretenders to European hegemony. We have always known how to emerge from the cycle of conflict and war, whether through the overthrow of alliances orchestrated by the Duc de Choiseul and the Count of Kaunitz, or the continental equilibrium organized in Vienna in 1815, whose dominant architects were Metternich and Talleyrand. lt is also true since the start of the European project: we recovered from the failure of the planned European defence community by signing the Treaty of Rome; we made the entry of the United Kingdom a trump card for European defence; we succeeded in expanding membership to the Southern European countries and offering them genuine economic opportunities. First of all, the Iraqi crisis, in which our countries were unable to overcome their divisions, even though the peoples of Europe were unanimous in their demand that international law be respected. Islamic terrorism, which struck at the heart of Madrid and London, revealing the vulnerability of our societies to new threats. We must be clear about membership criteria, which must be based not only on the European history, and identity, of candidate countries and their respect of the Union's values and rules, but also the Union's capacity of absorption. We must be clear too about forthcoming milestones: in the case of Bulgaria and Romania, they must become members as soon as possible on the basis of the next recommendations of the Commission. As for the Balkan countries, a region that is particularly, close to you both in terms of geography and history, we hope that they, too will join the Union on condition that they scrupulously respect the membership conditions. In the case of Turkey, the decision to open membership negotiations was made some weeks ago. This is a major political decision, the result of commitments made by Europe several decades ago, but also of the considerable efforts accomplished by Turkey. The process that has now started must be carefully monitored at every stage and must be conditional on compliance with the criteria set by the Union. lt is, finally, a process whose outcome must remain open until the end of the negotiations. In France, we decided that the last word must be given to the French people by way of referendum. But we must also, as of now, define a global strategy for enlargement of the Union and its relations with the surrounding countries: membership must not be the only solution proposed to neighbouring countries. We must also be able to offer them ambitious partnerships, likely to help them on the path towards democracy and economic growth. The second question to which we must reply is the question of Europe's ambitions. Do we want solely to become the richest continent in the world? Or do we also want to defend our values outside our borders? My conviction is that Europe means nothing if it is unable to convey its message beyond its own borders. We must demonstrate the legitimacy and universality of our principles by defending them in the international arena. We are the leading provider of development aid in the world. This is because we know that poverty and injustice are not only unacceptable from the moral point of view, but that, exploited by fanatics, they can create fertile ground for violence and terrorism. Europe has proved that it is capable of military intervention in countries where freedom is endangered. We are present in Afghanistan, for instance, to support democracy und help with the rebuilding of the State. We should also be active in respect of the major geopolitical issues, in a world that is constantly confronted with fresh crises. In Iran, we demonstrated that we are able to play a top-level role when we speak with a single voice. In the Middle East, we are the leading supplier of aid to the Palestinians: we therefore have a significant responsibility to seek a political settlement. This is particularly true today, with the recent accession to power of Hamas. This is a major challenge for us all: no progress can be made without clear and definitive renunciation of violence, without explicit recognition of the State of Israel and without strong support for the peace process initiated, in particular, by the Oslo agreements. lt is essential for us to speak clearly and promote justice in every part of the world and in every arena. I am delighted to give this afternoon's keynote speech. I am especially pleased with my topic: "What next? A new sound? ".I understand this session is supposed to be positive and forward-looking. That fits me well. Let me also commend the Austrian Presidency for taking this initiative. This gathering of politicians, academics, artists is a bit like an 18th century salon of Mozart's days.It is good that we sometimes take a break from our arid discussions on draft directives and Council conclusions. If Europe is to thrive - as I believe it will and must - it needs the creative energy that I hope this conference can provide. From time to time, we should debate where we come from; what binds us; what have we achieved and where we are going. My central argument is that much of today's pessimism is overdone.I believe we should continue our European journey. But equally change is needed. We must re-state our case. And demonstrate through clear action how Europe is serving all our citizens - not just select groups like big business, farmers or cosmopolitan elites. We all know that there are different sources of legitimacy. I am attracted to the notion of legitimacy through action. There is no need to dwell on the reasons for the sense of crisis or drift in Europe. These have been dealt with this morning. But I can say that this was a strange time to give in to self-doubt. For we have rarely been more successful.If you concentrate only on the daily headlines, you would think that the European Union is all about divisions and missed deadlines. About fudged compromises and political setbacks.But if you take a step back and look at the underlying trends, you will see a much more positive picture. This project has survived numerous crises – currency crises, the wars in former Yugoslavia and Iraq. Each time, we came back and emerged stronger. Over the years, we have delivered a remarkable run of successes: the single market, the euro, European defence policy.To these we should add other, less 'visible' successes: cheap airlines, reduced phone bills, passport free travel in the Schengen-zone. At the same time, the group has more than quadrupled in size: from 6, to 9, 12, 15 and now 25. If we are experiencing pains then these are the growing pains of a promising and still youthful Union.I also have the sense that politically we have turned the corner. Last year was difficult. But the agreement on the budget in December was a tipping point. It showed that also at 25 we can take difficult decisions. Yes, negotiations were tough. They always are over money. But No, the EU of 25 is not condemned to gridlock. There is a new mood in Europe: more forwardlooking, more pragmatic. Economic growth is picking up too, which is good per se and for our self-confidence. But this new momentum needs to be sustained. It is up to political leaders and pro-Europeans gathered here, to seize the initiative - and do something positive with it. I believe we must do two things in particular: First, re-state the case for Europe.Not in Brussels-speak but in clear, simple terms that make sense to citizens.Second, develop and implement a concrete agenda which is both ambitious and result-oriented. Clearly, the case for Europe is more contested. The memories of the Second World War no longer suffice to give legitimacy and impetus. But I will not shy away from stressing that the EU started as a peace project. And in essence it still is today. An outsider perspective may be helpful. It is striking that what we used to call the Great War, and then the First World War, was in China long referred to as 'the European civil war'. The Second World War which followed was genuinely a global war. But it started in Europe. And the greatest numbers of victims were Europeans. With this conference we mark the 250th birthday of that great European Wolfgang Mozart. But we also commemorate that 61 years ago today, on 27 January 1945, Auschwitz was liberated. This is a call for solemn reflection - and a call to duty. After 1945, an exhausted continent was ready to try a radical new idea. Not just ad-hoc international co-operation. That had been tried before and found wanting. But institutionalised integration. The success came from a combination of the big idea and the practical application. What worked was not a single blue print with a defined end-state. But perseverance, flexibility and strong institutions.So the European project started as a way to build banish war and build a new order of peace and law. Let's people forget: the wars in ex-Yugoslavia ended only 10 years ago. This is not ancient history. No one should take peace on the European continent for granted. More positively, peace and freedom are the pre-conditions for prosperity. And it is worth saying that never before have so many Europeans been so secure, so prosperous and so free. That, in part, is a consequence of the European Union. This brings me to my second rationale. The success of the integration project enabled us to enlarge the zone of peace and security. First to southern Europe. Then to Sweden, Finland and your own country Austria. And in 2004 with 8 central European countries plus Cyprus and Malta. It is a cliché to say that enlargement is our greatest success story. But throughout history, in the entire field of international relations, I do not think there is another strategy more values-driven, more original in its methodology and more successful in terms of results. I will keep on saying that because it is my conviction. Even if the political mood is now less favourable.Of course, while I support enlargement, I also see that many people have reservations. We need to balance these two considerations. One way may be by stressing that enlargement cannot be our only project. And certainly we cannot keep on enlarging without political and institutional reform. People want more than a market plus regional stabilisation project. I am convinced that more integration is needed in some areas - and perhaps less in others. The topics for more EU-level action are: research, energy, migration and asylum. I left out one more area. This is where our case is perhaps strongest of all: for Europe to become a global player.I see Europe as a new form of power. A force for good around the world. A promoter of effective multilateralism, international law and justice.The reasons are not so hard to explain. Our world is changing fast. It is becoming more uncertain and harder to manage. New technologies are changing industrial sectors overnight.In political and security terms, complex new threats are emerging, along with new centres of power. We are moving to a system of continents. And we all know that in a borderless world, events in faraway places affect our own security. It therefore is in our interest to be engaged in conflict prevention and crisis management. In this new security environment, we must be alert and creative. Above all, we need to be united. On our own we are political midgets. Policy takers. Condemned to drown in the maelstrom of events.But together we can help to shape the global agenda. Not resist globalisation but perhaps negotiate its terms. Not impose our views but get a hearing for them: in Washington today and Beijing tomorrow. I am convinced that our citizens want this. The polls show it consistently. And it is logical too. Europeans want their values - human rights, solidarity, justice and peace - promoted around the world.There is also another side. It is not self-indulgent to say that from the Middle East to Africa, from the Balkans to South East Asia and elsewhere, the call goes out: can Europe help? In short, when I travel around Europe, I hear a demand for Europe to play a greater international role. The same is true when I travel around the world. It may be fitting to paraphrase Nike's slogan: let's just do it. The good news is that even in the sensitive area of foreign and security policy, we have come a long way in a short period of time. Like a baby, in foreign policy too, we began talking before we started writing. And we started writing before we started acting. But now we do all three. I will not do a tour d’horizon and set out what EU is doing in every region or issue. I will not pretend either that we have an equally developed policy on every issue under the sun.But we have acquired a critical mass. After fits and starts, we now have a united, comprehensive strategy for the Western Balkans. The same is true for the wider Middle East, for Africa and for eastern Europe. In each of these regions, there is a substantive set of policies, agreed at 25 and backed up by a broad range of instruments. For decades we had been confronted by various forms of crises on our doorstep - but without the means to address them. Now we have a set of capabilities, plus decision-making procedures and a sense of doctrine on how to address these challenges.We have no fewer than 14 operations on-going. This is no small thing if you consider that only four years ago we had none. Our comprehensive approach – part civilian, part military - corresponds to the needs of today’s complex security crises. Moreover, our presence on the ground in crisis zones has increased our political leverage. For years we had been giving large sums of money without getting much political influence. That was our Achilles heel. This is now changing - for the better. In 2006, we have a lot of work to do: Iran, Kosovo, Israel-Palestine, Belarus, Sudan, the Democratic Republic of Congo, Nagorno Karabach to name a few. Each case will require a different response. But standing by and doing nothing is not an option.Thematically we will have to focus on energy security, terrorism, human rights, failed states, and non-proliferation - and many other issues besides. The point is not to dwell on the breadth of the international agenda. Rather it is to stress that results in all these areas are achievable. But on one condition. That we tackle them together, as Europeans. That we don’t just say that we must pool our resource and put out united message – but actually do it.That we overcome institutional jealousies and genuinely work for a single purpose. That we become perhaps a little less risk-averse. If we do, we can get great results. That, more than anything else, will impress our citizens – and the rest of world. Of course, we need many other elements for a new sound in Europe. Ideas on how to fix the economy; on how to handle demographic challenges and on what to do with the Constitution. On the Constitution, I will not go into details. I will only mention the risk of a "Catch 22" situation. Some people say that Europe needs to focus on delivering tangible results before turning to institutional issues. I agree with the sentiment behind that statement. But surely it would be much easier to get a Europe that delivers with the Constitution than without. To put it positively: if you want a Europe that delivers you should want the Constitution. And if you want the Constitution, you should work on a Europe that delivers. I remain convinced that Europe badly needs the ideas contained in the Constitution for a more streamlined and effective EU. Let me conclude.If we want a new élan and momentum in Europe, we need to keep it simple. We must make the case for Europe in plain language. Then, we should ensure that what the EU does fits well with both logic and people’s expectations. If it does not, pro-Europeans should not be afraid of saying so. And accept the consequences: politically, institutionally and financially.My summary arguments are the following: Where did we start? As a peace project among adversaries. What is our greatest accomplishment? The spread of stability and democracy across the continent. And what is our task for the future? To make Europe a global power; a force for good in the world. There is more to it, for sure. But from my perspective, this is the essence. This year, 2006, we should put Europe to work again. Some may say I am absurdly optimistic. To them I reply with Einstein's words: If at first, an idea is not absurd, then there is no hope for it. Dear friends, there is a new mood in the air. It is our shared responsibility and our common interest to make the most of it. 28.01.2006: Opening address by Federal President Heinz Fischer at the conference "The Sound of Europe" in Salzburg. Address by the Federal President Dr Heinz FischerCheck against delivery!Ladies and Gentlemen!Let me begin by expressing my admiration and appreciation for the marvellous music performance yesterday. I congratulate everyone involved in planning, organising and carrying it out. Please accept my sincere thanks.I should like to start straight away by telling you about an experience that made a lasting impression on me.I experienced my strongest emotional bond with Europe, the strongest feeling of my European identity, almost 32 years ago in autumn 1974, when I was travelling in the Far East with my wife. We arrived via Moscow, Irkutsk and Pjöngjang in China, just as it was emerging from Mao Tse Tung’s Cultural Revolution. There was hardly any tourism there at the time. It was a completely different China to the China of today. Whenever my wife and I met somebody from, say, the UK or Sweden – which didn’t happen very often – we met each other as Europeans and had in common this fact of being European. Nationality was a subordinate issue. What actually constituted this specific European identity?The fact of geographically belonging to the west of the Eurasian continent? Religious or cultural influences?A shared history?Or something else?At the time, of course, I did not formulate those questions so clearly, nor could I have answered them.Now I reflect a great deal on these questions, because comprehending the common “Sound of Europe” is of enormous importance to the future prospects of the European project, and I realise that the threads of a European identity reach far back into the past and are irrevocably intertwined.The mythology of Europa, which - as we know - was originally neither a geographical nor a political concept, begins with the tale of a young princess with whom Zeus, the father of the gods, fell in love when he caught sight of her on the seashore with her friends. He transformed himself into a bull and abducted her over the sea to Crete.But this girl Europa was not a European in the modern sense; she was the daughter of a Phoenician king from Asia Minor. And Zeus was not the divinity of a monotheistic religion of the type that is predominant in Europe today, but the father of the gods of a polytheistic pantheon.But Christianity, too, which is the main religion in Europe today, has its roots close to the homeland of the Phoenician princess and first began to develop in the regions around the Mediterranean Sea, which are absolutely not identical to the Europe of today. Europe was much smaller then and at the same time much larger. The picture is the same when we take a look at the cultural roots:Europe owes its numerical system to the Arabs. The beautiful epic of “The Iliad”, which had such a strong influence on European culture, concerns the battle for a city in Asia Minor, and Prometheus who, according to the myth, brought divine fire and knowledge to mortals although it was forbidden, was shackled to a rocky crag in what is now Georgia.The Museion of Alexandria, the most prestigious seat of learning of the time, a kind of Harvard of the ancient world, was in Egypt.In other words, many sources of inspiration of the blossoming European culture and science are not located in Europe in the modern sense of the term, or at least not in countries of the European Union.It was the sum of all these sources, these seeds of cultural diversity, the schools of thought of Asia Minor, Judaism and Christianity, the migration and mixing of the peoples, Indo-Germanic and Slavic influences, humanism and enlightenment, which gave rise to that European culture, that European model of thought and way of life, that catalogue of human rights, i.e. that modern concept of Europe to which we are now trying to give political shape. Again and again national interests are instrumentalised against Union interests. Many citizens of Europe feel they are not being taken seriously with their concerns and that they are light years away from the decision-makers in Brussels and elsewhere. There is a strong temptation to nationalise success stories and europeanise the unpalatable. There is a feeling – and it is more than just a feeling – that the democratic model is not working, or not working satisfactorily, at the European level. And to cap it all, there is the division between those already living in the European house who would dearly like to lock the door from the inside, and those on the outside who see the Union as the Promised Land, and who are knocking loudly on the door asking for admittance. It is also true that the answers given to the approximately 20 million jobless in Europe today are not satisfactory.The fate of these millions of people without work is a bitter reality.That is why we must also take announcements and targets concerning cuts in the unemployment rates very seriously. I am convinced that confidence in Europe depends to a very large extent on confidence in the social stability of Europe.What is more, in the final analysis, problems relating to migration, asylum or internal security also have a strong social dimension. Ladies and Gentlemen!The motto "Sound of Europe" is not only a reminder that the Mozart year has begun, but it is above all a reminder that, in addition to the economic foundation I have just been talking about, we must devote our fullest attention to the superstructure of Europe’s commonality.It is my firm conviction that a common cultural consciousness – with due regard for national attributes and differences - forms a decisive part of a common European consciousness.This European consciousness must have a strong, forward-looking dimension. It must take seriously its own goals in the area of science and research. It must be open for curiosity and for the new sounds of this world.And since this year is not only a Mozart year but also a Sigmund Freud year, may I say I concur with what Sigmund Freud said in September 1932 in a letter to Albert Einstein: "Whatever makes for cultural development is working also against war".Europe, the culture project, is also a project against war, and vice versa. We must never forget that. Ladies and Gentlemen!The inhabitants of the European house, which we want to be a peaceful and safe house, also need a firm foundation of common European values so that a good household based on solidarity can develop. These values above all include human rights, and consequently also our common rejection of the death penalty, which is a product of the European debate. They also - and in particular - include a common understanding of the theory and practice of democracy.The concept of democracy has existed in Europe since the time of Cleisthenes, i.e. for more than 2500 years; in the middle of the 1990s, Greece with right invited to a great celebration in Athens under the motto "2500 years of democracy in Europe". Yes, Cleisthenes and his contemporaries developed the model of democracy 2500 years ago. But this model was then suppressed and forgotten for more than 2000 years. In practice, there has been democracy in many countries for considerably less than 100 years. While the European Union is an association of democratic states, the idea of a pan-European democracy is still in its infancy. I strongly believe that the European Constitutional Treaty, for example, would bring progress in the development of a European democracy.On the subject of the Constitutional Treaty, procedural questions are not paramount for me at this stage. Far more important is the question: What do we want? Is it better for the future of the European Union to have such a Constitutional Treaty, or would it be better if it did not come about? For me, the answer is clear.Europe and Europeans as a whole would be much better off with such a treaty than without it; it was and is a compromise document drawn up by a pan-European convention at the request of all 25 governments and also accepted by the European Parliament, and represents very concrete progress.We should certainly take heed of what the European Parliament has to say on this subject.The possibility of a pan-European referendum - which I personally consider to be a good idea although the related constitutional problems are extremely complex - would be a positive contribution to the concept of democracy in Europe. Ladies and Gentlemen!Discussing all these issues is an important, common task. New ideas are welcome.And if we risk losing heart and becoming weary, we should not forget the trials Europe has overcome in the course of its history.Above all, we should bear in mind the Chinese saying: In the struggle between the stone and the water, in time, the water wins. In this spirit, not only have we learned that democracy, however vulnerable and imperfect, ultimately has a more promising future than the seemingly most rock-solid dictatorship, but we shall also prove that our humanist European values have more creative energy than can be destroyed by any national egoism. The European model is a model for the future. It deserves our confidence. 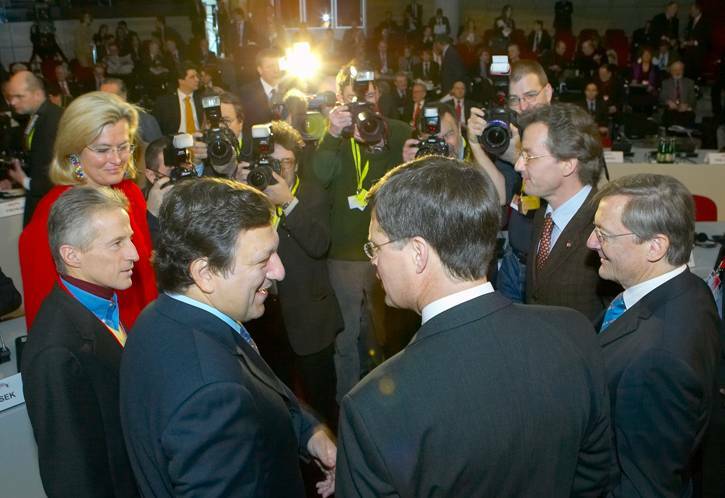 28.01.2006: Opening statement by the President of the European Commission José Manuel Barroso at the conference "The Sound of Europe" in Salzburg. Keynote SpeechChancellor Schüssel, Mr President, Excellencies, dear friends!It is my pleasure to be here at the invitation of the Austrian presidency on the second day of this resounding conference. The cultural diversity and wealth of our continent has been and is now being the driving force of this conference. I believe it can also be the inspiration to overcome the problems with which Europe is presently confronted. Yes, Europe does have problems. We have economic problems, social problems, demographic problems. First of all I think there is a confidence problem. In the broader sense it is a cultural problem - the way we look at ourselves and the world, while we face the challenges at the beginning of the 21st century. But when I say we have problems, I say with the same assurance that those problems can be solved. In Europe, we have the critical resources to overcome the problems. To find the right solutions. It has been said, we will only succeed if we take the concerns and the anxieties of the people, of ordinary citizens seriously. Let us be concrete. The most important concern is about employment, it is about jobs. It is the fear of the people of losing their jobs. Those who do not have a job fear that they will never find one. Parents have anxieties about their children future job. Young people, even if they get a good training ask themselves: Can I get a job, when I leave university or when I leave school? This is a real problem. Now some of the issues we have to deal with at the European level, like the internal market, the enlargement of the EU, are seen by many in Europe as a source for the problem. But all empirical evidence shows that there is success. That there are drivers for growth and creation of employment in Europe, take the last enlargement. All the empirical evidence we have shows that, and this is also true of globalisation. So this is the true difficulty of Europe. We have a paradox now, that many people in our continent see what can be solutions for our problems, a global economy, as a cause of our problems. And so we have come to a crucial point which I will address later in our panel about leadership. What is a European leadership? What do responsible political leaders do in the face of this paradox? When the very solution for an enlarged Europe now is to be dynamic, to be able to embrace change, but when this is seen by many of our citizens precisely not as a solution but as a problem and - let's be frank - as the cause of their concerns? Because today people are concerned in Europe about the way the internal market works, the way in which this last enlargement was achieved, and those problems exist.So we have to think: is globalisation going to go away or will it be there for the next years? I believe it will be here for the future. It is not a political decision, no country - not even the most powerful countries - controls this process. To a large extent it is ruled by technological changes. So we have two possibilities. And before being an economic decision, before being an ideological decision, this is a cultural decision. What is our position faced with globalisation? Are we going to hide? Are we going to pretend it does not exist, are we going to resist it or are we going to try to manage it with our values, the European values, the European way of live, our principles? I believe the answer is the second one. We have to try to shape this globalisation with our values to adapt it. The message that we send to our people should be a message of openness and not a message of retreat. It is a message of overcoming stupid, narrow nationalism that was the source of so many tragedies in our continent for hundred of years. We have to be able to understand that only the paradigm of openness (and here culture is very important) can really overcome the current difficulties.It is not because of the internal market that we have problems in Europe. It is not because of the last enlargement that we have some problems in Europe. On the contrary. It is precisely because we were not prepared from an economic point of view to face the challenges of this globalized world that we are witnessing some problems of adaptation. And then we come to the institutional problems. And let me be very, very clear about it. I believe the “No” votes in France and the Netherlands do not mean a “No” to Europe. I believe we have to take the concerns expressed in those votes seriously. As democrats we have the duty to do so. I think we are now in a moment of the European integration process that is different from the past. In the past it was possible that the institutional dynamic was creating the political consensus. I think nowadays it is the other way round. It is the political consensus that will create the institutional dynamics. So I think that the solution of our problems is not first of all an institutional solution.Institutions are very important in a Community based on law. But let's not pretend that the problems we have in Europe are because of the lack of the new Constitutional Treaty. Because this is not true.It is creating now the political dynamics so that we will solve afterwards the institutional problems. That will generate the institutional consensus. And so my word to the European leaders is a word of prudence, asking them not to open new cleavages now on institutional terms of Europe, to try to get a broader political consensus to generate a momentum to solve the institutional problem. And I and the European Commission are completely committed to the principles and values that are in the Constitutional Treaty. There should be no doubts about it.But we have to find the right conditions to address the problems and to solve them. And I believe we can do it, step by step. If we build a Europe of results.That is why we are coming up with concrete proposals - moving up a gear with our Lisbon strategy for growth and jobs. We are now discussing concrete proposals in March under the Austrian presidency, especially increasing the funds for research. Finland is an example for removing some obstacles to small and medium-sized enterprises. Having a common energy policy, or at least a common strategy for energy. So let's address the economic problems. There are some problems of democracy and transparency or accountability. Let's look at it. We have the subsidiary principle, we have the better regulation programme. We can solve the problems. We have some problems about enlargement. Let's discuss them. We should not be afraid, not denying problems that exist.Let's discuss them whilst keeping our commitment and see what the right pace for this enlargement is in the future. There is a concern in the public opinion. But at the same time responsible leaders have to think, whether they want to be led by public opinion or whether they have the courage to lead the public opinion in terms of what is the best way for Europe. I believe a consensus is emerging about priorities. Everybody agrees that the status quo is not an option. Everybody expects that we have to reform Europe. We have to reform Europe if we want to keep, preserve and reinforce our values. We have to modernise our policies and progressively we have to build a common agenda to achieve results. And it is a Europe of results. A Europe that shows its citizens that it is delivering on jobs, on growth and on a common purpose. This requires a lot of efforts in terms of responsible leadership that can create the best conditions to solve the institutional problem, because we have in fact an institutional matter to discuss and to solve.For all of this we need confidence. Now there is a lot of self-criticism in Europe. In fact I say very often, the one thing that could be exported is our excessive self-criticism. It would be good for us, it would be good for our trade balance and it would be good for others who don't have that same kind of self criticism which we do have. But we should avoid the idea of turning the period of reflection into a period of depression. We should now address what are the ways of getting out of this situation. Once again I believe inspiration can come from culture. Not because culture is at the service of economy. I don't believe that, on the contrary. I think it is the other way round. In my view culture comes before politics. We are now commemorating the 250 years of Mozart. How many politicians do we remember from 250 years ago? And how many current politicians of today will we commemorate 250 years from now?Of course economy is indispensable. Without the basic economic conditions we cannot live. But what makes life worth living in a public space is culture. And so what I get from the cultural message, what I get when I read the great thinkers of our time like George Steiner or Peter Sloterdijk, what they say about Europe is inspirational because it is the paradigm of hope. Mozart - a son of Salzburg and Vienna, a son of Austria - was travelling all over Europe from Milan to Paris to London to Brussels. He was not asking for a subsidy from the European Commission. But he was a true European who came back to his country and built on a variety of traditions in Europe from Italy to France and other traditions. This paradigm of hope, that I believe is what Europe needs. Because European citizens are not asking for less Europe. It depends. In some areas, yes. They want to feel the protection of the member states. They want to feel their community, their identity, and it is within this framework that they seek protection like social security. But they asking us for more involvement foreign affairs, a common front in fighting criminality and terrorism. They are asking us for a common strategy for energy. Two years ago it would have been impossible to discuss that. It would have been considered an overregulation. But now people understand that even the biggest members states alone do not have the leverage to discuss these matters with our main partners in the world. Do we need a common approach? We have to show to our citizens the value of the European dimension. And so I believe globalisation will be a driving force for our Europe. Let me conclude. I am told that Mozart composed one little piece of music when he visited Brussels. It is an allegro in C major. That could be a good sound for Europe, the sound of Europe should not be slow nor minor. And there we need the commitment of leaders. There we need a common script. Then we need to recognise: yes, we have problems, but in Europe we have the culture, the intelligence and the critical capacities to solve those problems. 28.01.2006: Keynote speech by Franz Welser-Möst at the conference "The Sound of Europe" in Salzburg. Ladies and Gentlemen,My language is really music, and so I ask for your understanding if my speech is perhaps not as polished as some we have already heard.The invitation I received to this conference tells of a society in Vienna in 1913 that was looking for a grand idea for the 20th century; the script I had prepared earlier took for its theme Mozart as a metaphor. I would like to try to connect these two topics. Recent mention of Mozart repeatedly emphasises his persona as a European, but usually this is only a reference to his extensive travels. If we take Europe to refer to Western culture, we must ask ourselves what Mozart’s status in Western culture is, and furthermore what constitutes Western culture. Among the arts that arose from Western culture, music is the most independent and highly developed. Poetry and painting exist at the highest level in other cultures as well. But the phenomena we commonly call “classical music”, music with this complexity and depth of expression, arose in this form only in the culture of the West. But this culture rests on two pillars - Hellenism and Christianity. The creative tension between the two modes of thought has still not been resolved today. At certain points, the two coincide, as in the concept of a common humanity, but they diverge when it comes to the question of the range of human action. The fundamental point of view of liberal, Western ideology that everything is possible is rooted in Hellenistic thinking, just as the modern belief in science.In opposition to this stands Christianity with its fundamental view that not everything can be possible. This basic tension has left its mark on Western culture. And no one has reconciled the inherent contradictions better and resolved the contrasts more convincingly than Mozart. This makes him a towering figure in the highest art of Western culture. And for this reason, I see him as the European.The two models of Hellenism and Christianity meet in Mozart. There is - as far as I can see - no other, equally strong connecting link. Goethe, for instance, was closer to the Hellenistic model. And it is most significant that he set himself the task of writing the second part of The Magic Flute, which remained unfinished. The Magic Flute provides a precise demonstration of how Mozart manages, even with the text of a third-class writer, to write a work of such deep humanity that it is not only acceptable but exemplary for the Hellenistic and Christian schools of thought. What is true for The Magic Flute can equally be said about Le Nozze di Figaro, Don Giovanni, Cosi fan Tutte, the late religious work, and even about his chamber music, symphonies and concertos. Even where there is no text involved, it is obvious to me how Mozart builds a bridge that spans these pillars of Western culture.I return to the title “Mozart as Metaphor” to ask what constitutes Mozart’s greatness. Recently, I have been annoyed with many statements about Mozart’s genius. For instance, a number of articles in the British press have claimed that he wrote only a few hits and that was all. On the other hand, there are serious studies of his music that seek to emphasise the Apollonian, the dramatic, or other expressive elements. I believe that the true greatness in Mozart’s music - and we should be careful not to project the Romantic picture onto Mozart that the person is the work - is to be sought and found exclusively in his music, and we can learn from that. There is no other composer who brings the different elements of music - form, harmony, melody, rhythm and tone colour - into such perfect balance. Therefore, the same chord in Mozart sounds like the work of a genius and in another composer, simply ordinary. Mozart is the reconciliation, equalising and balancing major elements. For a society, too, identity depends on the ability to balance. Within Western culture there ought to be an equilibrium among the different disciplines: a balance among natural sciences, humanities, religion, art and politics. In the 20th century, this equilibrium was more or less lacking. Politics has made its way into many other fields. for example, church matters are reported in the political pages of newspapers, and where we should be making artistic judgements, political slogans are bandied about. The 18th century is called the Century of the Enlightenment and the 19th the Industrial Age, we can confidently call the 20th the Century of Politics.I believe that the emphasis on politics, with the keyword “Two World Wars”, has violently disrupted the balance among the above disciplines, which is of major significance for Western culture and thus for Europe. Again and again I encounter examples of the current lack of balance: moral and ethical questions are almost exclusively considered on the basis of science and politics and, to a frightening degree, the media have been raised up as judges of moral, ethical, or specialist technical matters. One has only to look at talk shows or the articles on Mozart I mentioned. I believe that in my own field - namely that of the creative artist - there is a great need to depoliticise. Incidentally, after 20 years in the business, I can no longer stand the sight of combat uniforms in most productions. To avoid any misunderstanding: of course an artist can and should have a political opinion and express it. But in the creative arts, it has been a very long time since there was any aesthetic debate.There is a need, in light of what has been said, to clarify our categories. We must once again know what is what. Over and over one hears about the “Europe of Values” but we stand helpless in the face of “Americanisation.” I have been living with one foot in the United States for the past three-and-a-half years, and I find much there to enjoy. But I have learned that the average American means something completely different when he speaks about values than we Europeans do, namely house, car, dog.At the beginning of the 20th century, radical changes and transformations were brought about by dramatic political clashes. If we are looking for a grand idea for the 21st century, we can perhaps learn from the luminous figure of Mozart that the characteristic proper to Europe, the thing that is expressed in both the Hellenistic and the Christian stream, is the equilibrium of the disciplines I spoke of above.What is to be done? Other than clarifying categories, we need innovation in our creativity and our individuality. Innovation is the equilibrium between science and the humanities, religion, politics, and art. It is possible only with give and take, just as in music which, at the highest level, is also only give and take. Equilibrium has nothing to do with comfort. On the contrary, it requires intensive, possibly even uncomfortable dialogue and discussion among the disciplines. For my domain, I would like to say that we must not relinquish to politics the duty to educate - to educate and not to train. Rather, in the spirit of depoliticising, we must also do our share in order to hand on what Stefan Zweig called “the holiest superfluity of life.”My wish is for a Europe of quality and not quantity. This is the only way we can take advantage of our unbelievably strong tradition. We do not have a chance against the quantities that America, India, or China can offer. As the Americans say: “Don’t try to get even, be ahead.” Identity has something to do with intimacy and only when we know who we are will we be able to act with self-confidence. The European Way of Life. Is it a model for the world of the future? : Following the introduction of the topic by Paolo Bulgari and his definition of the European Way of Life as the ability of European citizens to count on the welfare state, to rely on democracy, to live in a healthy and safe environment and to practice solidarity, a heated debate amongst the 24 participants of the working group about the existence of this European Way of Life and its possible continuance occurred. The threat to the European Way of Life was perceived as coming from both inside and outside the European Union. From an economic perspective, the outward movement of capital and the loss of working places due to the inflexibility of the labour market to countries like India and China was mentioned; from a cultural perspective, the loss of solidarity amongst Europeans generally and the European nations in particular and the integration of immigrants was mentioned. In terms of remedies, the number of suggestions reflected the number of participants. Agreement was only reached on the essence of educational reform, the change of the labour market and the reform of the welfare state to facilitate the European Way of Life. Borders, Security and Identity Despite Blurred Frontiers: The complex issues of identity, borders and security were the main topics of discussion at table number five. The creation of a multifaceted identity is problematic, but a common occurrence in the 21 st century. Its impact has created a new concept of security, and this has affected our idea of borders. This creation of identity and questioning of borders and security has created a crisis amongst individuals which has resulted in a unified fear of "the other." All three topics were put in the context of Turkey and its negotiations to join the EU. The problems that both the EU and Turkey face are history, internal structures of the EU and the lack of communication between the elites and the public. In order for European ideas to have an impact on the global stage, Europeans need to come to terms with the creation of a complex identity, its pressures and how this changes their view about security and borders. Is there a democratic vacuum in Europe? : President Borrell has it clear: things have the color of the glass we look through. Indeed perspective seems to matter during the luncheon conversation. While Professor Monti says that optimism is needed and stresses what the European Parliament already does in terms of democratic control and accountability, and points at the uniqueness of the power it has with regards to the examination of commissioners, Mr Lipponen, President of the Finnish Parliament, is more concerned with the role national assemblies have in the European democratic dialectic. Professor Monti reminds us that there are difference between the national and the supranational level and recommends that we resist the temptation to shape Europe on what national states are, where President Lipponen says that to enhance democracy in Europe wider recognition must be given to national parliaments. Once more it is up to Professor Moravcsick, Professor at Princeton University, to remind Europeans of their strengths. He does so by explaining that European institutions do form a strict system of institutional checks and balances, of a kind that is hardly possible to find in any other democracy in the world. Commissioner Ferrero-Walder adds up to the enthusiasm and makes a point in saying that democracy is also a matter of political will and by looking at the commitment and the spirit of the Commission she has hardly any doubt: democratic values remain at the core of Europe. The lunch is almost over, panelists and guests nod and show signs of approval. Beyond the different perspectives, the impression is one of unity and concerned pragmatism: democracy in Europe is at work. Europe and the World of Images. What future for European arts and movies? : Among the various strands of discussion during the working luncheon session on the future of European arts and movies, discussions centred around the question of the suitability of the term "European" in relation to culture and arts. One participant stated that an artist can in fact only work on two levels, namely on the individual and on the universal one, but not on one on which delimitations, be they national or European, are imposed. Accordingly, participants were divided over the necessity of a common European cultural policy, but they generally agreed that artists need in any case to be granted ample opportunity to express themselves freely. The European Union as it is now, however, it was felt, does not grant enough space to arts and culture, which lose out in comparison to the economic dimension of the Union. The EU's image: Does EU need branding and PR? : The topic appeared to the working lunch participants as an easy question, to which they all agreed to answer yes. Such a clear-cut answer was based on a simple statement, made possible by the latest Eurostat statistics: European citizens are not against the European idea. They however feel disappointed and irritated by the way the unification of Europe is led. And this is for several reasons: an overload of regulation, a lack of consistency and an erosion of trust in Brussels' bureaucracy are a few examples. No artificial image is to be created: the EU record (Erasmus program, Euro currency) should speak for itself in order to foster a European identity, complementary to the national ones. In parallel, new initiatives have to be taken to concretely influence European citizens' lives. The reduction of unemployment is one of the topics which appeared most in the discussions. All in all, a 'new style', a new approach has to be brought across in the EU decision-making process, which involves above all better visibility. Indeed, the idea of peace, taken for granted by the new generation, is not enough to convince of the necessity of European integration. Therefore the need was expressed by the participants to act themselves as 'multiplicators' of the European enthusiasm among the European society.